 This is half of a Yin Yang Symbol. It can be sized, rotated and extruded by parameters. Special: The cutoff angle will prevent a sharp edge. At least I hope it is a new feature for printing. Print one in black and one in white for a complete Yin Yang Symbol.